It’s kind of amazing just how much we all speculate on the status of Jennifer Aniston’s personal life. Ten years after splitting from Brad Pitt we still link their names in conversation constantly. Jen has been engaged to Justin Theroux for nearly two years now and nearly every day a new story hits the press about these two despite the fact that Monday night was the first time that they had been together in public since last September. 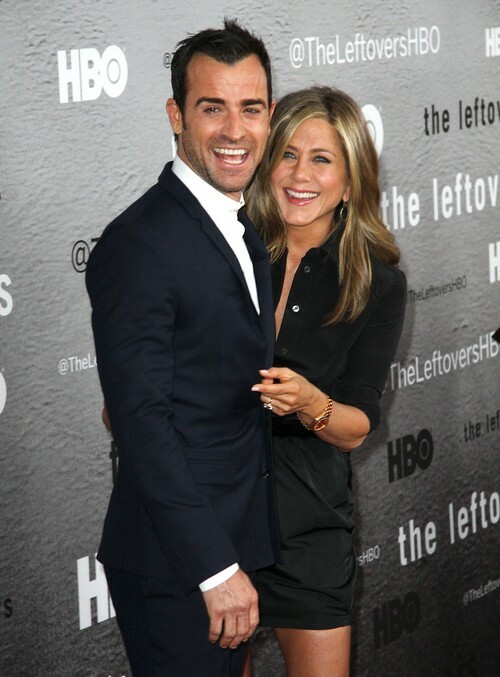 Jen was spotted on the red carpet with Justin for the premiere of his new HBO series The Leftovers and it’s funny how a few photos lead people to believe that all is well between them. Jen and Justin have withered through the kind of year that prompted him to move back to NYC full time 5 months before his series was to start filming. While they may love each other, for all intents and purposes Jen and Justin don’t even live on the same side of the country and they seem to do nearly everything apart. How solid can they actually be? At best they may hook up occasionally but it’s certainly not the same relationship that they shared when Justin first proposed nearly two summers ago. Do you think that Jen and Justin will ever actually make it official and get married or are they further from that point than they’ve ever been? She has had such bad radar with men, do you think that Justin is another bad choice or is it actually Jen that causes her own romances to crumble? Jennifer Aniston Pregnancy Announcement Expected During Oscar Red Carpet?